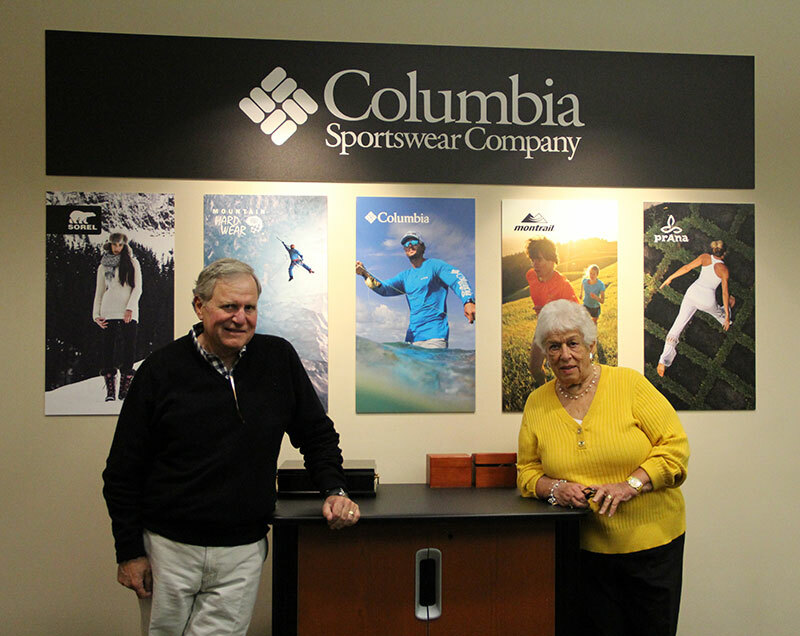 Gertrude Boyle, Chairman of the Board, Columbia Sportswear and Tim Boyle, President, Columbia Sportswear; excerpted from an interview with the National Museum of American History, November 20, 2014. Gert Boyle: I was born in 1924. My father was a partner in one of the largest shirt factories in Germany called Lamfrom and Biederman. My father had been a lieutenant in the First World War; my mother was a nurse during the war. We lived in Augsburg, Germany, which is about 40 miles from Munich. I thought I had a very normal life. My aunt would take us for a walk and tell us the story of the opera. We did have a radio that was a crystal set. Our house was close to a railroad, so you could only hear if the train wasn't coming. Otherwise it would just rattle on. My father had an older brother [who] was sent to the United States. They used to do that a lot. The eldest son would go to the New World. My grandmother had nieces, and nephews who had immigrated to the United States long before that, and started a business in San Francisco. They had a hide business. Before plastic, shoes were made out of leather, and so they would buy these hides from people and then saw them down. They said that it really smelled very bad all year long, except at the end of year when it really smelled good because they made a lot of money. Anyway, my grandmother in 1935 or 1936 came to the United States to visit her son and he talked her into staying because he said things were not really going well in Europe. So my grandmother had immigrated here. We were just, I think, very comfortable – it was a very comfortable life. We were just normal kids who celebrated Christmas, being Jewish, but we celebrated Christmas. I had gone eight years to grade school and then to a higher education school. And then, because of being Jewish, we were not allowed to go. It was a private school, but they wouldn't take us, so I went to school with the nuns. I think we lived a very protected life, but you couldn't help but know what was going on. You weren't allowed to go to the public stores. They wrote big letters across the front of our house – the Jews live here. Coming from a very protected kind of home, my parents said "Oh, things will get better and don't worry." My father sold his business…He sold the house and sold the business. We were only able to bring $20 a person out, but my parents were smart enough that they brought furniture over. They brought a dowry. I have two sisters, and we brought a dowry for each one of us. I remember we went to a shoe store, and we bought 30 pairs of shoes because as we grew, we wouldn't have the money to buy shoes, so then we would have shoes as our feet grew. They also bought clothing that was larger than we needed. I was 13 years old, and it was a real journey. They had ice cream, which is something we had never had before. In Hamburg, we went to Le Havre in France and then to New York. It was sort of an adventure. Then we came to Portland. We were the first German family that moved here [to Portland] because of Hitler. So we were written up in the paper. They let us go to school and I had to start in the first grade because I didn't speak English. Then a couple weeks later, I got to the seventh grade, and they said they were studying Germany; tell us about Germany. The people that went to school with me said they couldn't understand one word I said, but I thought I spoke English. One thing my father said when we moved here, "We are in the United States. You do not speak German anymore." We never spoke German at home. I think that helped us assimilate so much better because if you don't speak the language, you can't communicate with people. I remember the first Christmas here, my mother said she'd have to go buy a goose. She went to the grocery store to buy a goose and the grocer said, "No, no, no. You buy a turkey. You want to be in this country, you don't buy a goose, you buy a turkey." So we had turkey. I went to high school here and finished in three and a half years because they gave me credit for being able to speak a foreign language. I really loved being here, but I didn't want to be put in a little box. I thought, "Wouldn’t it be nice if I went someplace where the sun shone?" So I went to the University of Arizona. I really enjoyed it there, a party school. I met [Neal Boyle] at a fraternity party. He was a great influence in the way that I live now because he sort of taught me that if you can't do it one way, there's always going to be another way. I knew from the onset that eventually you have to look in the mirror and say "This is who I am. This is what I want to be," and so, you have choices to make. I never think of it as being an American or a German – this is what I am and this is the way I want to live my life. Tim Boyle: My mom really hadn't had any experience in the business, and I thought that I had a lot of experience because I'd worked here for six summers, 10 summers, or whatever. I really didn't have any experience, but the business was doing about a million dollars in revenue in 1970. My dad died in December 1970. We made a tremendous amount of mistakes. It became quite difficult and the business lost money from almost the beginning of 1971 until probably '75 or '76. In the '70s, it was about consolidating the amount of items that we offered for sale and then taking those items and expanding the distribution geographically. Then we'd established at least some positive net worth for the company, then we started looking at where we were manufacturing and we quickly outgrew the capacity of our own factory. In the early 80s, we had a certain amount of business under the Columbia label, but a lot of it was private label, manufacturing for L.L.Bean, Orvis, Lands' End, Norm Thompson, Eddie Bauer, anybody who was in that business. It became successful, kept us busy, kept the cash flowing, but we sort of realized quickly that we didn't have the ability to charge enough. So that's when we started focusing on our own brand. We're very fortunate that we have this international perspective because the business is now in many parts of the world. The U.S. is about to continue to make immigration easier, and will likely continue to make immigration easier, and I think that will be to the betterment of what is already a big immigrant society. Gert Boyle: [Immigrating to the United States] was the greatest adventure, and if I had to do it again, I'd do the same thing. It's a fantastic trip. Gert Boyle made a fishing vest for her husband with numerous small pockets to hold his fly fishing gear. After Boyle received requests from friends for vests, she realized there was a growing demand for outdoor wear. The origins of Columbia Sportswear can, in part, be traced to her original hand sewn fishing vest. This is an example of an early production fishing vest.